About a month ago, the rescue of approximately 178 dogs beagle of the Institute Royal research relumed the Brazilian Animal experimentation Law debate. In this week, some Brazilians representatives have discussed to install in the next few days a Parliamentary of Inquiry (CPI) to investigate all types of maltreatment of animals in Brazil. A Parliamentary Front in Defense of Animals have tried to approve projects prol-animals since 2003, but public policy about animal rights has always been treated as a joke in the House of Representatives. 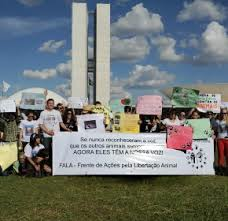 The debate involving the mistreatment of animals resurfaced after the invasion of the Royal Institute in São Paulo , by protesters opposed to animal testing . In Brasília, activists have proposed to create a federal fund for animals, Welfare Animal Code, and a anticruelty tag in the products. Companies should inform the packaging of their products if they were or were not tested on animals. Animals in research labs have since been protected under the Laboratory Animals Act –LAA (2008), legislation which set the rules about animal testing and research and revoked the Vivisection Act (1979). The LAA created the National Animal Experimentation Counsel (CONCEA), responsible for creating new rules about animal experimentation in Brazil. However, most of Brazilian Professors advocated that there are some incongruences with the Constitution that prohibits animal abuses. Looks like it’s time to draw the path that Brazil wants to take in defense of animals, rethinking laws that allow to use of animals as food, entertainment, and experimentation.